GitHub - scorelab/senz: SenZ is a new kind of query language that can be used to communicate with IoT devices. It is easily integrable, incredibly fast, and is in the highest end of security integration. SenZ is a new kind of query language that can be used to communicate with IoT devices. It is easily integrable, incredibly fast, and is in the highest end of security integration. Want to be notified of new releases in scorelab/senz? SenZ is a new kind of query language that can be used to communicate with IoT devices. It is easily integrable, incredibly fast, and is in the highest end of security integration. Also, it is developed live. As said earlier SenZ uses a #twitter like messaging syntax which makes this language more usable, powerful, and understandable. 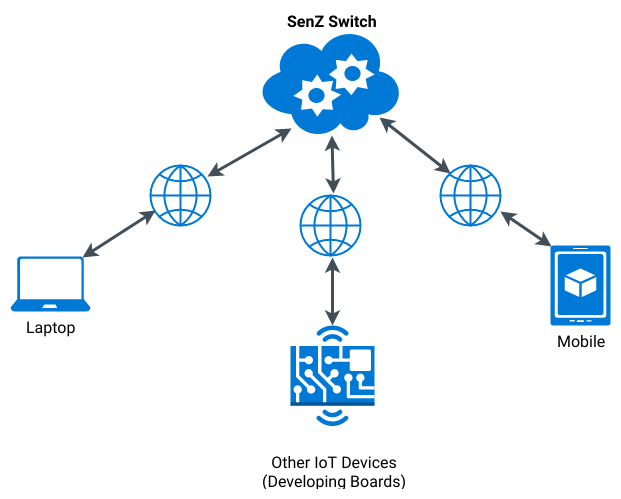 The communication between each of these devices are done via the MySensors switch which was developed using Python; a high-end application switch which works as a message broker. Once client devices are registered in the switch they should share their data to specific people (other client devices). Then, they are capable of sharing messages accordingly. Currently, the MySensors switch is implemented on two languages: one is Python and the other one is Scala. In either case it doesn't matter in which language your clients are built on. You can use either of the implementations to suit your product. As of now there are two implementations which work on the UDP packet connection and TCP packet connections. PUT To do some alternation to the device. When you need to control some device/application/client. DATA Reply to a GET, PUT or a SHARE. To send the reply with the requested data. SenZ messages follow a Twitter-like message structure. #<attribute name> Name of the attribute you need to use in the message. It depends on your purpose.